Geneva motor show 2012: Skoda Citigo 5dr | What Car? 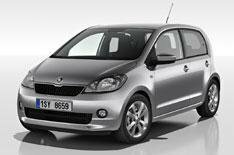 The Skoda Citigo 5dr model will be launched at the Geneva motor show in March, ahead of going on sale in May. Prices for the Citigo have yet to be revealed, however the identical VW Up 5dr is 375 more expensive than its 3dr counterpart, and we'd expect a similar premium for the Skoda. That would mean a starting price of around 7900 for a 5dr Citigo. We will be driving the Citigo 5dr next month, so be sure to come back to whatcar.com on February 17 for our verdict on the car. Meantime, check out the review of the VW Up 5dr.